"Oi! If you see police running you should bloody run as well," an officer shouted at me. We were being evacuated from the area shortly after I heard a member of the public telling police they had seen a green rucksack under a bin. Nearby the wrecked, roofless bus stood in a cordoned area just yards from Euston station in Tavistock Square. Newspapers blow around in the street - a sign of a normal Thursday morning commute cruelly interrupted by terrorism. I saw several ambulances rush to the scene as police co-ordinated the impressive emergency effort. A shocked commuter travelling in the bus in front of the target vehicle told me there was a strange sense of calm in the immediate aftermath of the explosion. He was lucky. Others clearly were not. When I first arrived in Russell Square in the heart of London's Bloomsbury, the police were still sealing the area. Initially it was possible to see the bus from a distance of perhaps half a mile. Then the alarm was raised - there might be unexploded bombs in the surrounding area. Suddenly we were rushed into the park in the centre of Russell Square and out the other side. This is a part of town populated by student halls of residence, big hotels and the buildings of the University of London. Bemused tourists, office workers and students hung around not knowing quite what to do next. I slipped through the Institute of Education and gained a vantage point in sight of the bus along with other journalists and cameramen, on the edge of Tavistock Square. As the tragedy unfolded one weeping, traumatised medic, wearing bloodied surgical gloves was comforted by a colleague. Around the corner in Endsleigh Place a clearer view of the bus was to be had. Vehicles were stopped randomly around it - an indication of the chaos in the aftermath of the explosion. "Get out of here," a policeman shouted at a gaggle of reporters, "if you can see the bus you're in the line of fire if there's a secondary device." Nearby Euston Road - normally clogged with traffic at all hours of the day - was shut. It leads down to Kings Cross Station and there was no way through. I made my way by bike across Tottenham Court Road, Oxford Street and then through Soho - the heart of the West End. The roads are quiet apart from emergency vehicles, but the pavements were clogged with people still trying to get to work or tourists seeing the capital's sights. People don't talk to each other in London that much but in the aftermath of the explosion on a bus in Tavistock Square strangers recounted to each other what they heard and saw. There was a terrible sense of shock among members of the public. Police I talked to were more phlegmatic. It was always a case of not if but when London would be hit, one officer told me. Amid all the chaos of today's atrocities there was one particularly potent irony. In the garden square where terrorists chose to ignite a bomb on a bus full of ordinary people is a statue of Gandhi. 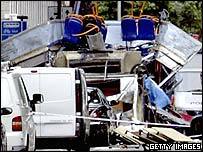 It overlooks the wreckage of the attack and it was hard not to wonder what a man whose name is synonymous with change through peaceful protest would have thought of the events of 7 July 2005 and all that led up to them.